Congenital or neonatal hypothyroidism is a severe chronic disease, when normal thyroid gland activity is impaired and the amount of important thyroid hormones is reduced in blood. Why does this happen in children? 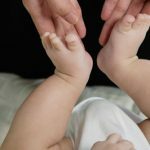 What are the basic symptoms of neonatal hypothyroidism? 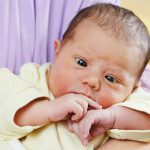 Why is neonatal hypothyroidism dangerous? How to treat it? We will tell you all about congenital hypothyroidism to help you understand the nature of this disease. Control of body temperature and primary metabolism. Regulation of the metabolism of fats, proteins and carbohydrates. In childhood, thyroid promotes harmonious development of the body. A thyroid gland produces 2 types of hormones: hormone thyroxine (T4) and hormone triiodothyronine (T3). While congenital hypothyroidism, hormone secretion decreases, and therefore their lack is observed in the body. Such a condition can cause strong inhibition of both physical and mental development in children. According to medical statistics, hypothyroidism in babies occurs in 1−2 cases per 5000 newborns. Baby girls are more prone to congenital hypothyroidism than baby boys are. They suffer from neonatal hypothyroidism two times more often. 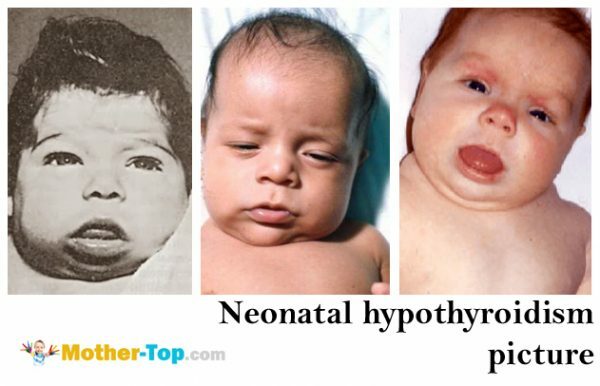 Neonatal hypothyroidism and genetics are closely related. In most cases, some genetic mutations provoke the development of congenital hypothyroidism due to impaired formation of a thyroid gland during pregnancy. The sensitivity of thyroid cells to iodine decreases. This causes impaired transport of substances necessary for iodine metabolism and the synthesis of hormones. Disorder of the hypothalamus — secondary hypothyroidism. The hypothalamus regulates not only the thyroid gland, but also other endocrine glands. Lesions of the hypothalamus are often accompanied by severe endocrine disorders. Resistance to all thyroid hormones. Usually, decreased sensitivity of body cells to thyroid hormones occurs because of a mother’s taking antithyroid drugs during pregnancy. For example, if a pregnant woman suffered from goiter. 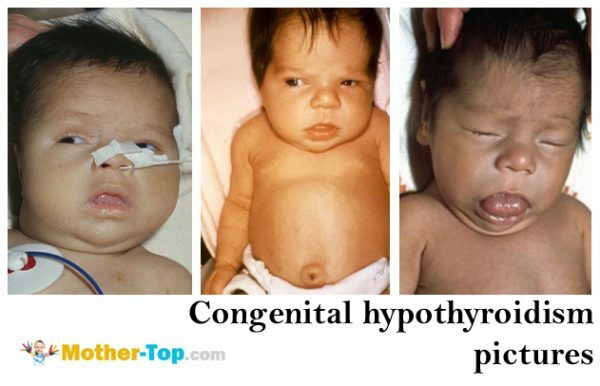 In 75−90% of cases, congenital hypothyroidism occurs because of hypo- or aplasia. Often hypoplasia is combined with ectopia of the thyroid gland in the trachea or root of the tongue. Malformation of the thyroid gland starts in the 4th-9th week of fetal development because of viral diseases, autoimmune thyroid diseases, radiation, toxic effects of drugs and chemicals. The most evident symptoms of congenital hypothyroidism are a delay in physical and mental development, later fontanel closure in children, late teeth eruption and dry skin. Signs of neonatal hypothyroidism often do not manifest themselves during the first days of life. They appear only after a few months, when parents and doctors clearly see developmental delay. 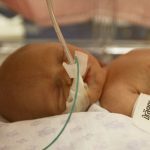 Only a small proportion of newborns experience evident symptoms of neonatal hypothyroidism after birth. One can hardly detect neonatal hypothyroidism in the first days of a newborn’s life based on its symptoms. Early baby screening for congenital hypothyroidism helps with the diagnosis. All newborns are tested for hypothyroidism on the 3rd or 4th day of life in hospital. First hypothyroidism screening was performed in 1971 in Canada. This condition is characterized by low blood levels of thyroid hormones with a simultaneous increase in the concentration of thyroid stimulating hormone (TSH) in blood. The main purpose of screening is to identify infants with high TSH levels. High TSH concentration gives reason to suspect hypothyroidism in a baby. Early detection of hypothyroidism and its timely treatment is vital for a normal growth of a child in future. Lack of thyroid hormones leads to irreversible pathologies of the nervous system. That is why the treatment of congenital hypothyroidism in babies should start no later than in the first month of life. development of various chronic diseases. Timely and correct treatment ensures normal mental and physical development of a baby. The basic method of hypothyroidism treatment in newborns is substitution therapy with levothyroxine. Attention! Information about the treatment of congenital hypothyroidism is only for informational purposes. Consult your endocrinologist about treatment and drugs! In European countries, treatment with Levothyroxine usually begins not later than in the first month of a baby’s life: in England — on the 10th-15th day, in Germany — on the 7th-8th day.Levothyroxine in small doses has an anabolic effect. It contributes to the formation of all the necessary substances for a baby’s body growth. Medium doses of Levothyroxine contribute to the body development, increasing tissue demands for oxygen. Levothyroxine also affects metabolism. Positive effect can be observed 7−12 days after starting treatment. By its chemical structure, Levothyroxine is similar to the hormone thyroxine of the thyroid gland. This is its main advantage in comparison with other drugs. After taking Levothyroxine, it stays in a certain concentration in blood, and the body consumes Levothyroxine when it needs it for development. Thus, it is possible to avoid a high concentration of this drug in the blood. Daily dose of Levothyroxine is given in the morning an hour before breakfast with a small amount of water. Normal levels of TSH in blood serum. TSH control should be carried out every 2−3 months during the first year of life, and every 3−4 months after 1 year. Thyroxine blood level in children becomes normal 10−14 days after starting treatment. As for the TSH level, it will return to normal in 2−3 weeks. 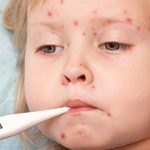 Levothyroxine is prescribed for each child individually, according to laboratory and clinical data. The drug comes in different doses. Parents should be well aware of the prescribed dose because both deficit and overdose of levothyroxine can be harmful.